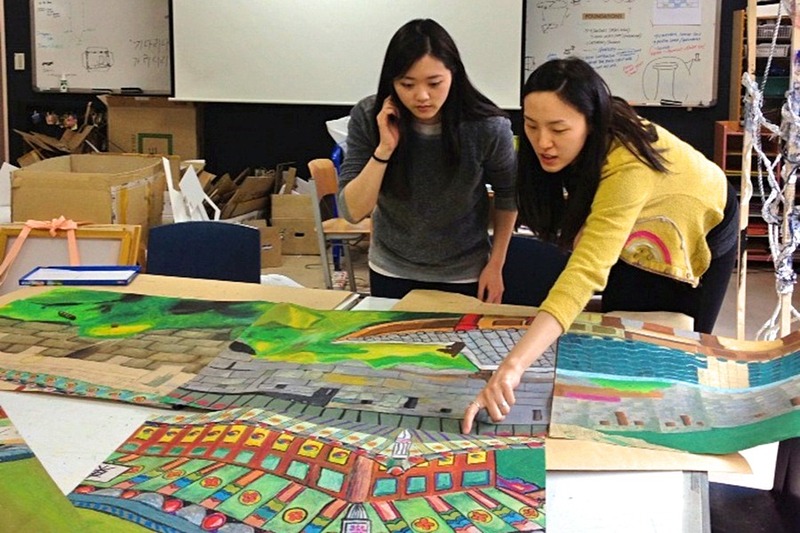 The winning composition drawn by Susanna Yun (Class of 2013) was selected. 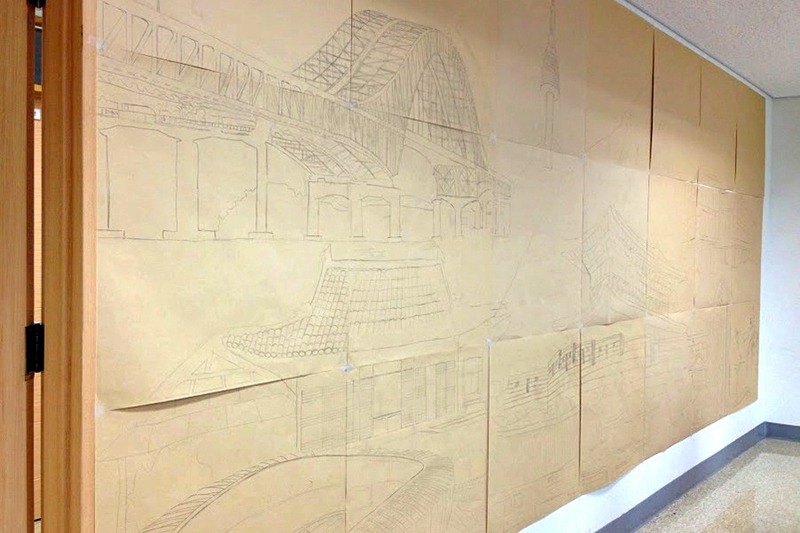 After undergoing some adjustments, the composition was then projected and hand-drawn onto 40 square sheets measuring a total of 3.75 m tall x 6.00 m wide. 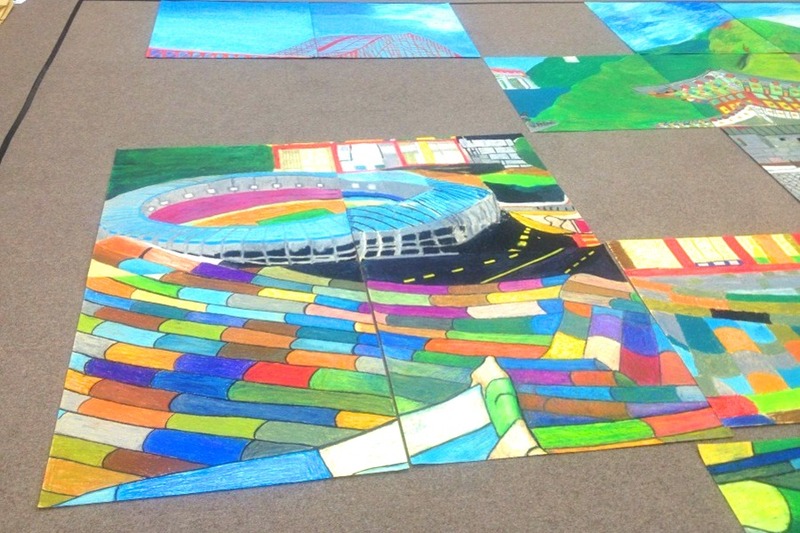 From April 22-26, 2013 over 1000 students, parents, teachers, and staff worked together to color the massive piece using oil pastels. Each of the 40 sheets measured 75x75 cm and were assigned as follows: 18 sheets to ES, 12 sheets to HS, 9 sheets to MS, and one sheet to staff. Once the 40 sheets were collected, members of the Music and Art Committee laid out the pieces to blend colors to lessen the distinctions of where one sheet ended and another began. Each of the 40 sheets was then carefully cut into 25 pieces, creating a total of 1,000 square sheets measuring 15x15 cm. 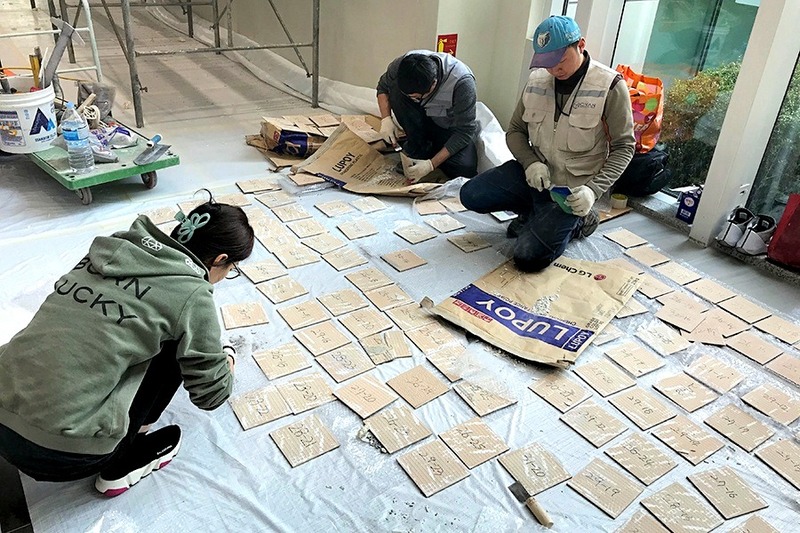 Next, they scanned each sheet and then printed them onto ceramic tiles. 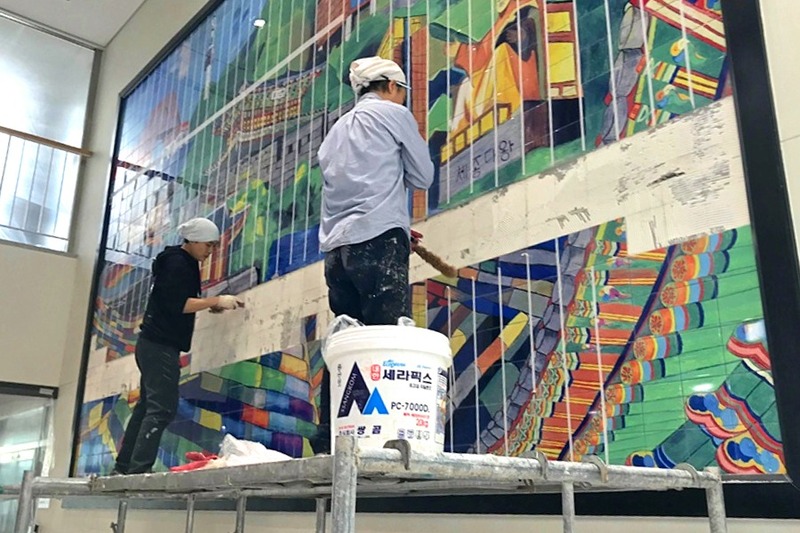 Once the wall next to the Business Office was sanded and prepped, tile professionals came to install the 1,000 colorful tiles. Finally, the large wooden black frame was added. Executing such a large-scale project involving over 1,000 people took a tremendous amount of planning, passion, and persistence. Although the Music and Art Committee (MAC) faced numerous obstacles along the way, they pressed on knowing that the Home Away from Home piece, when finished, would be a permanent visual reminder of creativity, unity, and teamwork that the entire community could enjoy. Click here to view photos of the 2013 Community Art Project. Needless to say, the PTO and many others were very disappointed to learn that some of the tiles had become loose and had fallen off during this past Christmas break. 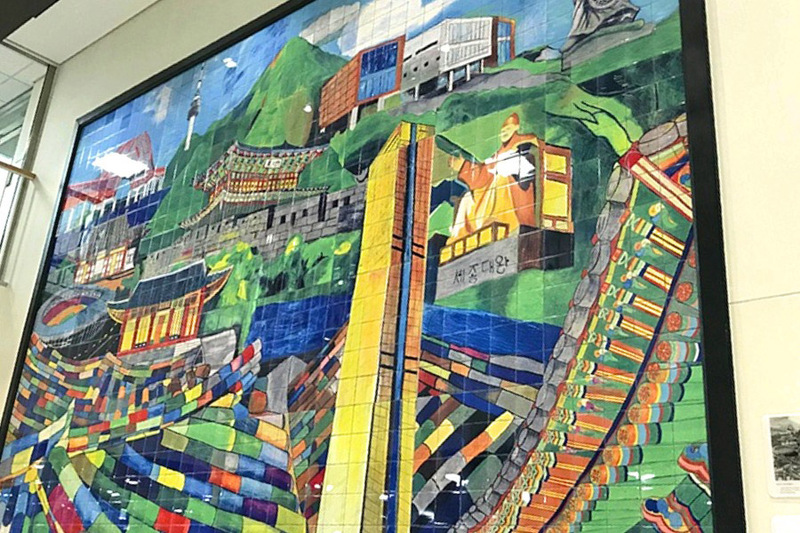 The YISS PTO, together with the support of the YISS Maintenance Department, was able to reinforce the artwork for the safety of the community until it could be repaired and restored to its original condition. On March 2, the missing tiles were successfully replaced, and the piece was restored to its original condition. In order to prevent this from reoccurring, there are plans in place to regularly check the tiles moving forward. It was quite an undertaking to identify and reprint the necessary tiles. We want to thank YISS parents Jina Choi and Janet Han for all of the time and effort invested into coordinating the repair project. They are two of the original three parents who spearheaded the Home Away from Home project in 2013. 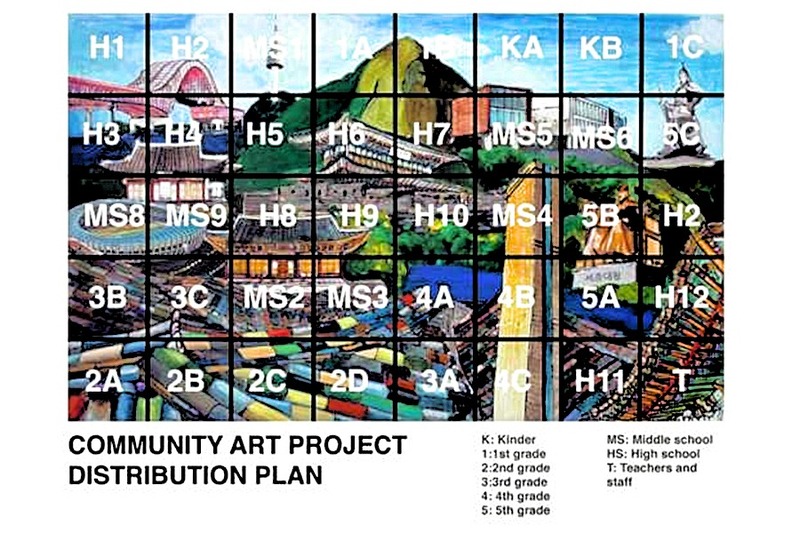 Many thanks also to the PTO for providing the funds needed to restore the mural for the YISS community.